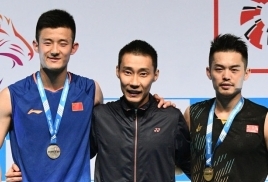 Five nations shared the titles in the Ciputra Hanoi-Yonex Sunrise Vietnam International Challenge which ended in Hanoi on Sunday. However, it was heartbreak for hosts Vietnam when Thailand's second seed Pornpawee Chochuwong upset home favourite and top seed Thu Thi Trang in straight sets 21-16, 21-17 in 50 minutes for the women's singles title to deny the hosts a double. 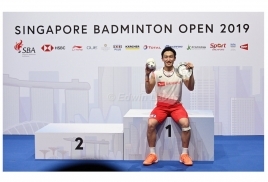 Earlier Nguyen Tien Minh kept to his top billing in the men's singles when he tamed second seeded Thailand's Khosit Phetpradab 21-14, 21-17 in the final which lasted 45 minutes. Thailand were also at the receiving end in the men's doubles when India's No 6 seeds Satwiksairaj Rankireddy-Chirag Shetty came back from a set down to beat fifth seeds Trawut Potieng-Nanthakarn-Yordphaisong 17-21, 21-9, 21-15 for the title. The women's doubles was a battle between two unseeded pairs with Japan's Erina Honda-Nozomi Shimizu defeating Malaysia's Joyce Choong-Tee Jing Yi 21-14, 19-21, 21-14. China took the mixed doubles with unseeded Shi Longfei-Tang Pingyang pulling off a 21-16, 19-21, 21-15 upset win over second seeds Irfan Fadhilah-Weni Anggraini of Indonesia.